Greetings! I live in a small town in southeastern Minnesota with my husband and two adorable cats, Biscuit and Pearl. I work full-time in marketing at a Senior Living Community. I have experience writing web content and press releases as well as blogs. I freelance for local magazines in the Rochester area. When I’m not writing you can find me reading, making a healthy meal, running, hiking, biking, kayaking or snowshoeing. If it’s an activity that requires lots of energy, I’m hooked. Hi. I nominated you for a Liebster Award! I love your blog and can’t wait to read your response! Thank you so much for the nomination! You are too kind! I nominated you for the Very Inspiring Blogger Award!! You are so kind! I was surprised at how much you appreciate my thoughts and words. I can’t thank you enough for your support and readership. It’s difficult to put yourself out there and it is always nice to know that it inspires someone. I love to read your reflections on life; your prose is poetic and engaging. Thank you for sharing. Keep writing for magazine! It feels like I am talking to myself, I should start to write for magazine again, my motivation is bit low nowadays 😀 – You did great by having some of your articles published in several magazines. So inspiring! Yes, I love writing for magazines. I have been very fortunate to work with editors who send me assignments. I don’t know how long that will last, so, I try to appreciate every assignment that I receive. Hi Akanksha! Thank you for reading and commenting! Pretty cool that you are in touch with people from Minnesota! Funny how that happens. Have a great day! Thanks for the like and follow on my travel blog. I’m going to enjoy exploring yours. Hi! Thank you for the follow to my blog. Hi! Thanks so much for reading and commenting. Please don’t feel guilty about working out. It’s a lifestyle for me…it always has been. 🙂 I am glad you like the name of my blog. I think it fits me just fine. If you listen you can hear creativity whispering to you. Hi! I just wanted to let you know that I nominated you for The Very Inspiring Blogger Award! 🙂 Have a wonderful night! Oh not at all! 🙂 Thank you for letting me know, and I hope you have a great week as well! Thanks for following my blog, Spilling Ink. I love The Whispering Pen. All the best! You are welcome, Ali! I look forward to reading your blog! Last night, I dreamed about using an old fountain pen, and it made such a nice sound as I wrote with it. Then, your blog name popped up in my inbox today. I love these little coincidences. This is interesting! I plan to tackle it tomorrow. Sorry for the late reply! Hey, thanks for finding my blog and stopping by! Your seems great, so I will follow it now and hope you will follow back. It is nice to see new people here! Thanks for including me in this. I'm Nicole, and I am a freelance writer in the southeastern Minnesota region. I love reading, fitness, woodworking projects with my husband and traveling. © Nicole L. Czarnomski and The Whispering Pen, LLC., 2014-2015. Unauthorized use and/or duplication of this material without express and written permission from this blog’s author and/or owner is strictly prohibited. 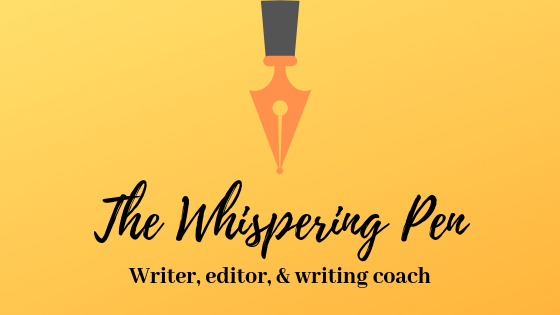 Excerpts and links may be used, provided that full and clear credit is given to Nicole L. Czarnomski and The Whispering Pen, LLC., with appropriate and specific direction to the original content.